We each come to our pet care businesses with different strengths and dreads. Some of you may be excited to interview a potential new hire - while others are not. 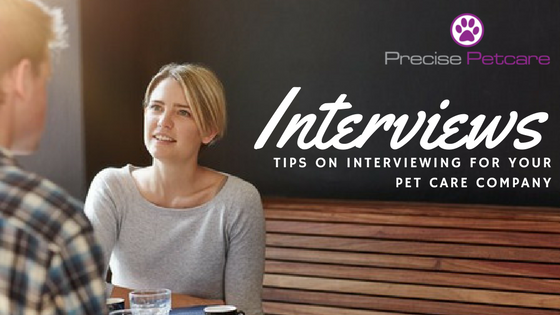 No matter which category you fall into, as a pet care business owner, employees help you grow and one of the biggest hurdles to your growth - could be your interview process. Before you have a candidate lined up to have a sit-down, you have already made some important decisions. Are you looking for an IC (Independent Contractor) or an employee? What type of work do you have available, at what times and for what pay? I highly suggest getting these factors lined up before you bring any potential new hires into an interview. Have a clear role in your head of what position you are looking to fill that will be best to help your company grow. Another piece of the hiring puzzle you want nailed down is your ad. Have several people look over your hiring ad and do your very best to put yourself in your potential candidate's shoes - does your ad attract you, would you do that work for that amount of hours or pay? What type of person do you think your ad attracts? Does the job and company sound inviting? Have you listed so many requirements that working for you does not sound enticing? For more details about your job post, our friend Bella Vasta from Jump Consulting provides a great article about this very topic. Remember, where you post it can be just as important as what you are posting. 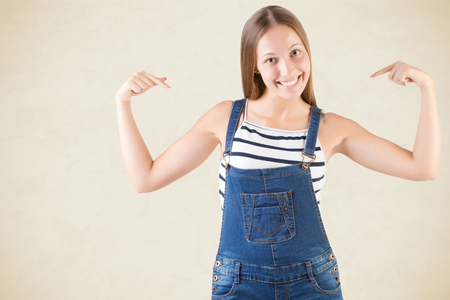 For the sake of this post we are assuming your ad was stellar, you've nailed down your needs and you've attracted someone that looks promising. The first step I take before even placing a phone call is I Google them. You would be quite surprised at what you may or may not find. I have discovered some serious discrepancies on resumes or information available about them on the Internet. Now, you certainly could be finding the wrong person, but thanks to email platforms like Gmail, many of the applicants have pictures so finding them on Facebook or other social media outlets can be a little easier. The best way to search is via their email but don't spend too much time doing this. I use this as a quick info grabber, often I can tell what their hobbies and interests are from their social media posts. This could also prove fruitless as lots of people these days are just difficult to find, I don't usually let that worry me but if I can't find anything on the Internet about them, I make a note of it and dig a little deeper in the interview. You're excited because what you found doing research or just based off of the information they have provided - looks promising. My next step is a phone call. I like to call them out of the blue and catch them off guard if I can. I don't even call this a phone interview because while I do recommend having a procedure to follow, I find that I mostly use this to get a better understanding of if an actual interview will be worth our time. The most productive use of the phone call is to ascertain that they indeed meet your requirements. Despite listing that having a car and being available during X hour is a must, I cannot tell you how many people make it to the phone call and I find out they don't have car, are not available for all needed hours or worse, they only want to walk small dogs, preferably only Toy Poodles (true story). You loved their cover letter, their resume is well rounded, you found nice pictures of them hiking with their dog on Facebook, and they sounded delightful on the phone. Time to BRING THEM IN! For many years I did not have an office and operated out of my home. I personally didn't want people coming to my house because if things went south and I didn't end up hiring them - that could get awkward having them know where I live. My local Starbucks has served as a great meeting place for many wonderful interviews and plenty not so. Find a place if you do not have an office that allows you some quiet space or a slight bit of privacy - you are about to ask this person a lot of revealing details. These are the classic, what are your hobbies and interests? What constitutes the perfect Sunday morning? Why do you want to be a pet care provider? What's your favorite restaurant? A simple question about their ideal Sunday morning can relay lots of goodies. Often it tells you if they are an early riser, what they do in their spare time and what's important to them. I do also directly ask if they would consider themselves a morning or night person. I even include asking if they have worked for or hired a professional pet sitter. I'll go as far to ask if they are listed on sites like Rover or Care and ask if they have interest or plans to do so. It's a good way to find out if they are looking to do this on their own or if they really are interested in just providing the care while a company does all the scheduling and admin for them. One of my favorite questions in this category is, if you were to open your own business what would it be and why? Not only do I learn about people through some fascinating answers but it also tells me a lot about their goals, ambitions and dreams. If they answer “pet sitting” my red flags go up. Other great get-to-know-you questions are what did you like and dislike most about your last job or how do you approach a task you find challenging? These let you know a little about their preferences, past work environments, what they enjoyed about them and didn't. It also lets you know how and what they find challenging, that alone can be very subjective. Thoughtful and reflective questions certainly are just another tool to get to know the potential staff member but they lighten up the seriousness of the interview - they often bring a smile to the interviewee's face. Not many people expect to be asked what would they do if they woke up to find an elephant in their backyard or do they believe the cat has the right to chase the mouse? I enjoy asking what they feel their spirit animal is and why? I disperse these among the more serious questions and find my candidates relax and warm up a bit. While I admittedly like someone to be a tad nervous as I believe it shows a great level of care, I don't want them to be uncomfortable in front of me. Discussing philosophy seems to relax many and you can have fun with it. 3 - WHAT DO YOU DO? Asking a person what they would do in situation X is a great way to find out how they think and function in stressful or unusual circumstances. I ask what they would do if they set an alarm off, if a dog bit them, how they would handle an icy walkway, what would they do if they lost a key etc. These questions force them to come up with a remedy before they have been trained or even know about our policies and procedures. The questions you could ask are endless, you could ask them what they would do if a client asked for their phone number, how would they handle an unhappy human client, what would they do if they locked their cell phone and keys in their car? Endless questions to help you get a glimpse into how this person thinks. Finding out what the candidate thinks of themselves is enlightening. 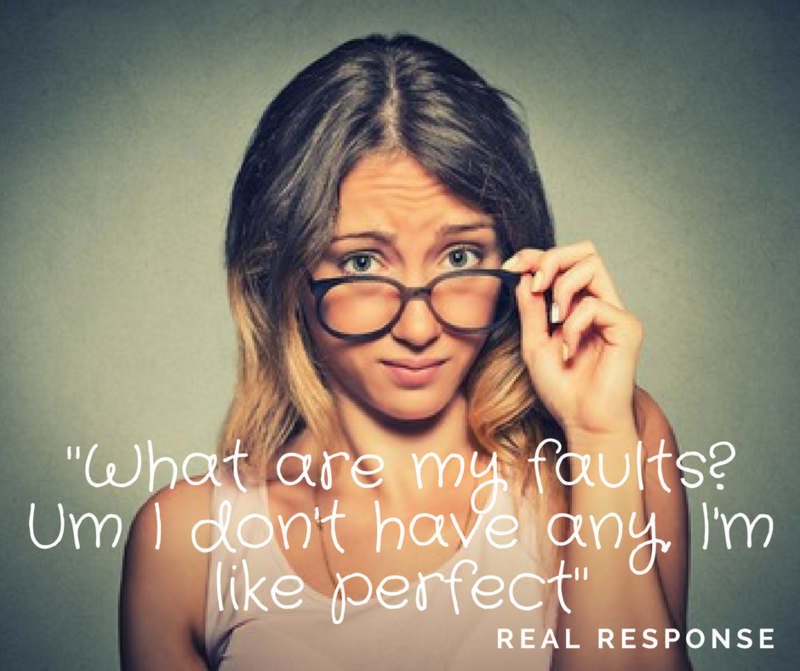 You can find out their confidence level or even how much they have interviewed or prepared if they can rattle off a well rehearsed response to, what are your faults? I also like to ask, list three adjectives that best describe your personality and tell me why. I have had people struggle with these questions. I ask them what achievements are they most proud of, what is the most difficult decision they have made in the past 2 years and what skill do they have that they would like to improve or further develop? I want to find out what this animal-loving person thinks about who they are and how they function. 5 - DID THEY DO THEIR RESEARCH? I understand the different opinions on this but I will state mine. I get irritated when a candidate sits across from me and says, “why no, I didn't have a chance to check out your website so I am not aware of the services you offer”. I have been on a few pet sitting forums where it appears to be more commonplace for potential pet sitters to not have looked up or researched the company to which they have applied. I find this appalling. I might be jaded since I have been my own boss for the past 14 years but if I were to look for employment or when I was looking into pet first aid and CPR companies, I sure as heck spent a good deal of time finding out as much as I could about them. Even with writing an article for Precise Pet Care, if I'm going to produce work, energy or information for or about a company, I want to know about that company! I expect that of my interviewees especially since information is so readily available these days. I don't expect them to have memorized our foundation story, the names of our client pets or even the exact services that we offer but they better be able to tell me something that proved they did some homework about our company and that based on what they know, they want to come join our team. I ask this question about halfway into my interview process and if they answer that they haven't had a chance to look at our website, I skip ahead through a few more questions and then give them the, “I'll let you know by X date” canned response. It offends me if you couldn't tell and I hope that for some of you, during your interview, you will not only add this question if it is not there, but you will give some weight to their answer. 6 - WHAT QUESTIONS DO THEY HAVE FOR ME? I like to end the interview open ended, allowing the potential new hire to ask any and pretty much everything that they want. I have hired people that have asked nothing and I have hired people that took an extra hour to learn about how we operate, what our standards are, what type of clients we work for etc. This is by no means a make-or-break question, I just like to afford the person the opportunity to learn whatever they may want to know. I LOVE talking about my company so I encourage the chance to learn about what inspired me to want to take care of people's pets. This can be awkward, I'll admit it. Many times I have really liked the person and wanted to hire them right then and there but I always let them walk away. I do not want to appear desperate or impulsive even if I am! I always thank them for their time and sharing a bit about themselves with me. I'm pretty chatty and if I like them I probably have started up some conversation and they are either engaged or I notice they look like they want to get away. My interviews range from a 1/2 hr to sometimes 2 hours depending on the rapport build and how much I like talking with the person. This is someone you are letting into your client's home unattended, you have to feel like you know what type of person they are, what inspires them and if they will fit into your company culture. Employees are assets when they are good and headaches when they are not. I spend a good deal of effort in my hiring and interviewing process to avoid wasted effort down the road. There is nothing worse than spending all the time placing the ad, screening applicants, researching them, talking on the phone, interviewing, on-boarding and training only to find out something you should have caught earlier like they are moving in 3 months across the country (true story)! Each candidate whether I liked them or not walks away with me having told them I will let them know by X date. If I don't like them I tell them I have a few other interviews and will let them know after I have made my selection and if I do like them I give them a glimmer of hope and say I will definitely be in touch. I always leave with warmth. Whether I liked them or not, plan to hire them or not - I still want them to think and say nice things about my company. My life-long love of pets turned into a dream career in 2003 with my husband. 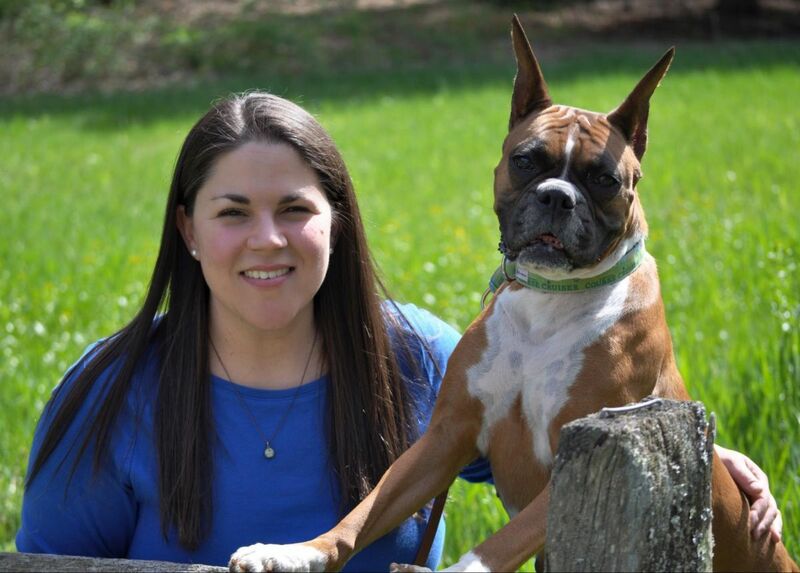 We had met that same year at a dog park and together we created a professional pet care business based in the greater Boston, MA area. The company won a slew of awards and later expanded into a grooming and holistic pet supply store, in addition to the pet sitting. My efforts are now spent as a pet industry consultant, pet business marketer, pet space blogger and devotee to making sure pets get to be the animals they were born to be. I have presented at several pet sitting association conferences, provided seminars & webinars to professional pet sitters and those searching to enter the pet space. I have been a mentor to many in the pet industry as well as those in the small business world. My most direct role is acting as the product manager and blogger for ProPetHero, which provides accredited ER veterinarian instructed online pet first aid & CPR training for pet owners and professionals. In my spare time I am a volunteer and foster home for The Boxer Rescue Inc, a health conscious breeder of Boxers, as well as an active member in a few kennel clubs. When not working or volunteering I am traveling to agility, lure coursing and conformation trials. When not at a trial or finding a good home for a Boxer through the rescue, I can be found training with my pups, hiking with them on trails or playing in my neglected garden. I truly love Precise Petcare. You get a lot of features for a great price, and the system support is amazing! Overall the software is leaps and bounds closer to our dream software than anything on the market. Robust set of features and has already cut down time on the management side. Easy for the staff to use as well. I am not quite sure how I managed to operate my business before using PPC. Once I got over my fear of change, the transition was super easy and moved quickly and my clients' response has been positive overall. The support on the Facebook page especially is extremely helpful. Love the community that it provides.